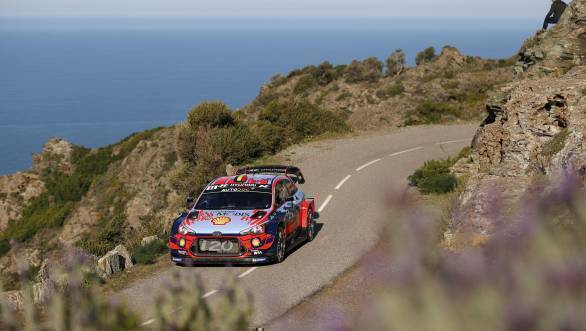 Hyundai driver Thierry Neuville finally won a nerve racking Tour de Corse in which the lead changed on each of the final four stages. 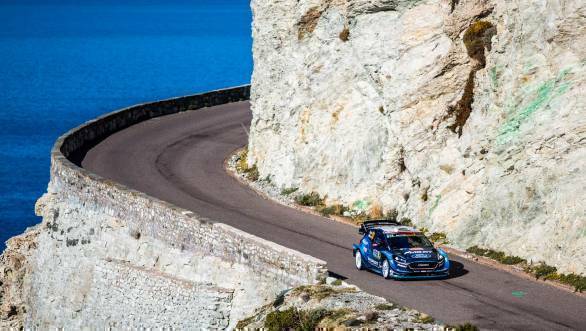 Just when M-Sport driver Elfyn Evans seemed set to win he became the last of many top drivers to suffer from punctures, finally dropping behind the troubled Citroen of Sebastien Ogier who had won no stages at all. For half the event Evans had been battling Toyota driver Ott Tanak before the Estonian punctured ending one of the closest fought WRC events in memory. On the final stage Fabio Andolfi snatched a 3.9 seconds victory in WRC2 Amateur while Julius Tannert won Junior WRC by 1.9 seconds. The event featured many roads unknown to teams which led to an unusually frequent pacenote and consequent driving errors and perplexing handling of the competing cars. Dry sunny conditions were perfect for the fastest ever Tour de Corse, the first time it was won at an average speed of more than 100kph. This was an event where the outcome was hard to predict. The route was quite different to recent years, the weather before the event being very unsettled with snowfalls and powerful storms in the days beforehand, yet the event turned out dry and sunny. It was hard to imagine that having world champion Sebastien Ogier back in the Citroen team any other team had any chance of success but for Citroen their home event almost turned out to be a disaster. It was Ogier's persistence in driving an ill-handling C3 WRC that provided a face saving second place. And as for the chances of success for French drivers who were formerly highly respected for asphalt rallying, only two French drivers, Sebastien Ogier and Sebastien Loeb finished in the top 15 places. And one of the most unexpected situations is that the many recently resurfaced roads would result in so many punctures, which for both Tanak and Evans lost them victory. And even the winner was surprised he had won. Neuville finished the final stage completely unaware until his mechanics ordered him to go to the podium! One of the most welcome aspects of the event was the performance of the M-Sport team Fiestas, on an event where this year the team did not possess the skills of Ogier, yet until his fateful final stage puncture Evans had been leading the Frenchman. Evans' teammate Teemu Suninen drove an impressive event which he had never contested in a Word Rally Car, finishing fifth. It was the first occasion Ogier had not scored a scratch time on a rally since Sweden 2018. It is hard to understate the general sadness when Evans finally lost the rally, even though it is an event where he has excelled before. Not all was lost for the Ford team as they won the (albeit very poorly supported) WRC2 Pro category in the hands of Polish driver Lucasz Pieniazek, despite crashing on the final stage on Saturday. On events where most teams experienced unexpected technical problems the M-Sport team cars seemed to be the most reliable. Hyundai experienced handling trouble with their i20 Coupes while Loeb struggled to catch up time lost when he damaged his suspension after an impact with a curb. Neuville had very mixed fortune, with experiencing suddenly changing handling characteristics from stage to stage. Finishing first, fourth (Sordo, after a solid run) and eighth (Loeb) provided the team useful championship points and enabled them to retake the lead of the Manufacturers' series. Toyota came to Corsica expecting to be competitive. Tanak duly led from stage 2 till his Saturday afternoon puncture which was caused by a broken wheel. Kris Meeke damaged his chances on the first stage of the rally when he damaged the suspension and struggled to catch up after that, though he proved his speed by being fastest on the Shakedown and then winning the Power Stage. Jari-Matti Latvala had two punctures during the event and generally had an unhappy time. The biggest mystery was why the two-car Citroen team did not impress. Ogier's result came from non stop determination to overcome eternal understeer, slightly improving as the event progressed. And then when he made a blitz on the second run of the long Saturday stage the anti-lag system failed yet he still scored his best stage result of the event. Esapekka Lappi was struggling to be confident in the car all event. All Manufacturer registered drivers completed the full route. With only two drivers (Skoda's Kalle Rovanpera and M-Sport's Lucasz Pieniazek) in the WRC2 Pro series, each hoping to finish the rally and gain points but both crashed, Rovanpera retiring permanently. Attention then centred on the R5 cars in the Amateur category. Eric Camilli inched into a lead of a half minute until he punctured, letting Fabio Andolfi into the lead. On the final stage on Saturday Camilli's VW Polo caught fire and burned out, causing the stage to be cancelled for most of the drivers on the event. Towards the end of the rally Nikolay Gryazin challenged Andolfi and the pair secured a Skoda 1-2. Andolfi victory on Pirelli tyres ahead of Gryazin on Michelins. Kajetan Kajetanowicz (VW) was a very lucky third, being spared driving the long 44km stage on the Saturday afternoon after his power steering failed. The excitement in the Junior championship intensified as the rally progressed. With only two stages remaining only 6.6 seconds separated the top three drivers. Jan Solans held an early lead after the first stage but then Tom Kristensson led all the way to the penultimate stage when Julius Tannert finally recovered from his Day 1 puncture and won the category. It was all change at the head of the main championships with Hyundai retaking the lead in the Manufacturers' series, now leading Citroen in the Manufacturers' series by 12 points; in the Drivers' series Thierry Neuville had taken the lead from Tanak (down to third), the third different driver to lead the series in four events, ahead of Ogier by two points. Lukasz Pieniazek took the lead in the WRC2 Pro series. The WRC2 Amateur and Junior series continued with the same category leaders, Ole Christian Veiby and Tom Kristensson, but now ahead of Nikolay Gryazin and Jan Solans respectively.